Before World War II Woolworths had leapt far ahead of its competitors by tight disciplines behind the scenes. Its systems and procedures had been legendary in the 1930s, and were a closely guarded secret. Without the benefit of computers and other data capture technology, the Company's Buyers still received detailed analysis of the sales of their items in each store, along with information about lost sales from out of stocks and insight into the items that customers were requesting which were not part of the range. This had traditionally been done on paper, with each sales assistant completing forms at the end of every shift, and those winging their way up the bureaucracy, via the Store Manager to District Office, which summarised them before sending them to headquarters the next day. As the years had passed, much of that information had been sacrificed as the cost of gathering it had become more expensive. 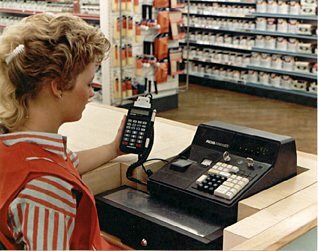 But by the 1980s other retailers were gaining similar insights by deploying modern computer equipment at the checkouts, with mainframe computers behind the scenes to add up all of the data. Woolworths was being left behind. 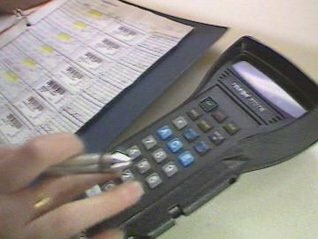 The 1990s marked a turnaround as the High Street stores became the last major retailer to adopt 'EPOS technology' (Electronic Point of Sale). By waiting the chain was able to implement it much more cheaply and far more effectively than many of its rivals. 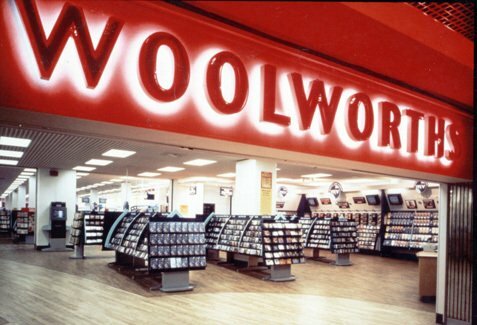 In its heyday Woolworth's excellent merchandising systems had set it apart. In the 1930s, without the benefit of the technology that we take for granted today, a system of word-of-mouth and paper forms ensured that every week the Buyers at headquarters received regular, timely feedback from the shopfloors of the rapidly expanding chain. In the 1950s this advantage started to decline. Margin was sacrificed in a rush to expand the range, and controversially the Board did not follow other retailers in moving to self-service. Instead money was pumped into computerising the depots and accounting. Despite an efficient central supply chain, the stores continued to do everything in long-hand until the mid 1980s. Individual order forms were used until 1977 (top left) when they were replaced by 'pre-print' forms (bottom). 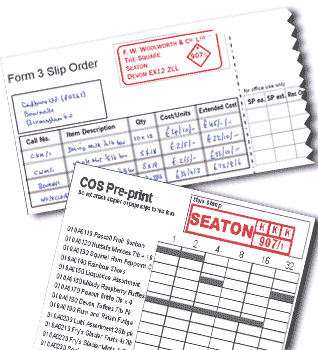 These were completed with a felt-tip pen in-store and then sent by post to the Central Accounting Office, where they were scanned into a computer for processing. Stock counts and the requirements for the next eight weeks (known as 'stock commitments') were all calculated in-store, using cases and fractions of a case. For example, if a store sold 27 mugs each week and the mugs came in an outer case of 144, their commitment would be 8 x 27 cups (176), divided by 144, expressed as 1 case and 32/144ths of a case. 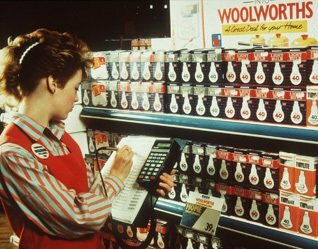 In 1982 the new owners of the business felt systems were a priority, believing that modern technology could improve efficiency and drive down inventory levels. The Group FD Geoff Mulcahy took control of systems for the High Street stores, and soon launched a Merchandising Systems Project. Microcomputers were introduced into the Marylebone Road headquarters in 1984, and were replaced by PCs when these became readily available for the first time. He also initiated analysis work in-store, looking for ways to simplify the bureaucratic approach to ordering. A team led by new IT Director Chris French chose Telxon Hand-Held Terminals to automate the order capture process (right). Bar codes were stuck into the old Binders. Stores scanned them and keyed in the quantity required, based on preset re-order points and quantities which they had calculated themselves during the set-up. The supply chain was adapted to make more items available individually rather than in outer cases. All orders were placed in single units. The initiative proved popular with the stores and improved efficiency. Soon applications were added to help manage the space and pricing and to capture sales data. The hand-helds were successfully integrated with the new cash registers from Anker Data Systems. The acronyms 'HHT' and 'ADS' soon entered the stores' vocabulary. This enabled department-level sales reporting, giving Managers the first ever insight to range performance. The technology was much less powerful than it is today.The devices had less capability than a basic 21st century mobile phone and had to be plugged together like an ipod to transfer files, before bluetooth and RF wireless technologies came along. A 14.4 kilobytes per second modem was used to send and receive data from the computer centre. They were 'dumb devices', which could only be reprogrammed by replacing their storage chip ('EPROM') with another written on a specialist machine. Chris French and his successor Dan Bernard worked tirelessly to drive the technology forward. They introduced store specific Range and Order books to save sticking barcodes into books and made the apps easier to use. In parallel new central systems packages were integrated, including the World Wide Chain Stores System, which was used in the supply chain from 1987. The next challenge was to overcome the difficulty in rolling out new applications to the hand-held terminals in-store. The process required engineering visits to update each of 5,400 tills and 2,000 terminals manually, which was costly and time-consuming. In 1989 each store was sent a back office PC. 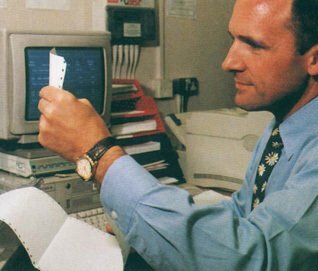 Initially this was used as a 'parent' for the hand held terminals, allowing software to be distributed to the stores much more quickly. Later specialist applications were added. In a sign of how much computing has changed since, the Philips PC-compatible machines of 1989-90 had the maximum 640 Kb of Memory, 80286 chips running at 4 megahertz (1% of the speed of a top-spec machine today), and 'huge' 40 megabyte hard disks (about a twentieth of a £5 memory stick today). Despite this the computers went on to revolutionise many aspects of store operation. In 1970 Store Managers had carried out their duties with only word-of-mouth from their staff. They had to wait for the results of annual stock counts to find out what had sold. By 1990 they were able to see sales, stock and financial information on screen, on demand, and to manage by exception. The PC initiative was such a success that within a year, the Company decided to go a step further. It began trials to implement EPOS scanning tills across the chain. Kingfisher was the last major retail group to embrace this technology. One of the key challenges in the move to EPOS was to get manufacturers to add barcodes to the packaging of the products. The chain's eclectic mix had grown to more than 30,000 items. Each barcode had to be captured, validated and added to a central file. A team of colleagues in the flagship London store in Edgware Road, W2 started to capture these as work to select a supplier continued. Olivetti Systems and Networks won the £18m contract in collaboration with Post Software International. The initial system was piloted in the London store for a year in 1990/1 before moving into roll-out across the chain between 1992 and 1994. The total roll-out cost, including store training, building works and bolt-ons like credit card payment, exceeded £30m. 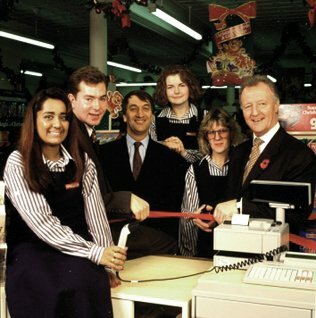 By the time the project's two Director sponsors, Dan Bernard (Systems, holding the ribbon, centre) and Martin Toogood (Retail Operations, right), cut the ribbon to mark the completion of the project in the Autumn of 2004, EPOS had already driven big changes in-store. Transactions were faster and goods were no longer individually priced. Shelf edge labels gave the price and also helped to simplify stock control. There was also an automated replenishment system behind the scenes. The simplification enabled a steady reduction in staff numbers, achieved mainly by not replacing people who retired or left. Between 1990 and 1994 the number of employees on an 'equivalent full time' basis fell by a fifth, from 25,000 to 20,000. During that period the total headcount across the chain remained about the same, reflecting a drive to recruit more part-time staff. The Retail team had promised these savings as part of the Business Case for the £30m investment. However it proved much more difficult to persuade the Buyers to adapt their approach to exploit timely, accurate sales data. The cost was incurred at a difficult time. Despite a bright new concept store in Houslow, West London, which was crammed with new technology, all was not well. Unforced errors in the supply chain caused shortages on the shelves at Christmas 1994. The profits dip was accentuated by a shortfall in the anticipated commercial benefits of the EPOS investment. It took three years to force through the changes in buying practices that had been envisaged in the business case. Some investors expressed concern at plans to use the same system at sister companies B&Q and Superdrug, until the improvement in service speed at Woolworths became apparent. The IT and Retail Teams sought ways to plug the shortfall. They leveraged the new infrastructure to introduce new profit-generators in-store. 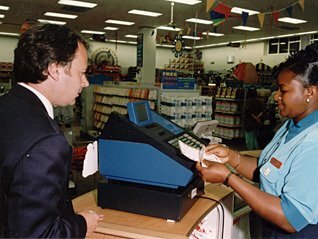 The stores were the only national retailer to complete preparations to sell tickets for the National Lottery in time for its launch in 1994. Camelot acknowledged this by choosing over 400 branches to receive the tightly-rationed terminals. A pilot loyalty card scheme 'Street Value Plus' was also initiated quickly and cheaply and helped executives to understand customer demographics and purchase patterns. In parallel new 'EPOS Promotions' were introduced. These rapidly boosted promotional sales from 12% to 20% of the firm's total turnover. The Buyers had recognised the potential, and had engaged with the initiative. By the launch they had negotiated supplier funding for all of the three for two, link save and Buy One Get One Free offers.